I have detected a pattern with every new project I take on: I go through a period of anticipatory excitement, then of intense freak-out, then I relax somewhat, and then I wonder what I did before said project entered my life. The most obvious project in my life that follows this pattern–and one that would be familiar to many of you–is parenthood. Owning a milking animal is neither as hard nor as long-term, but indeed, I went through these exact same steps. I’m happy to let you know I am in the “what did I do (with all my time, mainly) before I had a goat?” Freak-out moments aside, it’s been a fun endeavor. It’s true what they say about dairy folk. We are early to bed and early to rise…the first time in my life that I have ever been so inclined. And I get up excited and fresh and ready to start the day! Highly annoying, it’s true; luckily, I wake up a good two hours before anyone else does so I don’t have anyone to offend. But a part of every one of my days is devoted to milk and its management. Making cheese has been a huge part of the “fun” of this new project. I make cheese about three days* a week. I devote one day of these three to take on one new aged and/or procedurally difficult cheese. 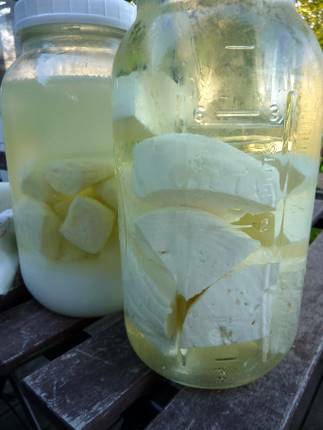 The other two days’ cheesemaking are usually devoted to making feta (our daughter is a Feta Fool) or to the easy-peasy kinds like a chevre, an unaged pressed cheese, or ricotta or paneer/queso fresco. Ricotta and paneer and queso fresco aren’t technically cheeses** (did you know that?) but still, that’s what I make. And I make a weekly rotation of buttermilk and yogurt and sour cream…the first two can also be used as cultures for the above cheeses and the last one is because I selfishly love sour cream. And what with all the eggs around here, ice cream, custards, puddings are happening. Let’s just say I am not getting thinner with my new hobby. 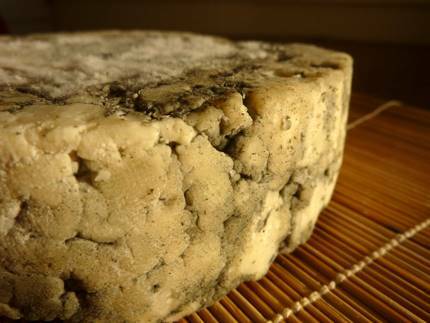 Most cheeses excepting the fresh kinds require a long aging process. In other words, for many of them, it will be months (months!!) before one can even taste them. Talk about slow food! Some are much slower than others. Parmesan will take a year. Blue cheese, up to a year. Cheddar, brick, and colby, six months plus. 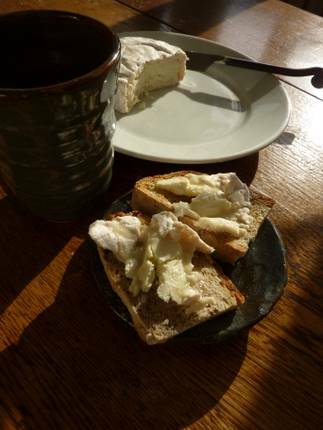 Brie and Camembert, six weeks. Feta, a month. This is not a hobby for those bent on instant gratification. Gratification, though, why yes. Our goat, however: Having triplets and then producing all this wonderful white stuff has taken quite a lot out of her. I do remember this with my own breast-feeding days: I could eat for three, and often did, yet the pounds kept coming off…let’s just say that’s not a good thing if you’re a skinny goat. So I am slowly stepping back the milking to once a day. This is a win-win: she’s not stressed and can put the weight back on, I am not stressed and I’ve got more time to weed those gardens. The milk quantity should reduce further too. At the top, I was getting almost two gallons a day. I would be quite happy with 3/4 of a gallon. Considering that she potentially can be milked for a year and a half or longer, that’s still a lot of milk. Lucky us. *Not all day obviously. 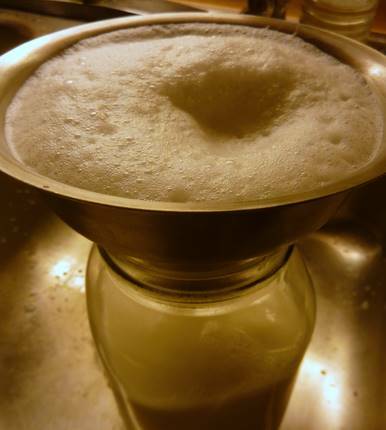 The process starts with the morning’s milk and usually ends around dinnertime, say, for a chevre. They’re pressed or hung to dry. Some are heated somewhere in there; some are inoculated with other molds and good beasties, some require lots more of your time and some require nearly none. It’s a big world, cheese. **Cheese snobs tend to categorize according to technique. It’s a cheese if the milk has been subjected to an enzymatic action and/or lactic acid fermentation; it’s not if it’s made by simply acidifying (via vinegar or lemon juice) the milk as these three are. The most common enzymatic action used to make cheese is by using rennet, a derivative found in one of the four stomachs of nursing ruminants (calves, kids or lambs) which contains the enzyme protease that helps a nursling break down and digest milk solids. There are other non-stomach rennets out there, some derived from plants or molds with coagulant properties. There’s even a genetically engineered rennet available. Me, I use both vegetative and stomach-based rennets, both work, but there’s a taste difference in some cheesses. And lactic acid fermentation: quickly, this is the aging process all milk and milk products and even pickles and kimchi and sauerkraut undergo with time. This is making me so anxious to get my fence done! Your cheeses look amazing… I think I could eat that whole jar of feta myself. Oh this is sounding more and more like my own life! However since I’ve only been milking for a month, I haven’t been as adventurous as you. But with all this excitement….I feel it coming on!!! I only milk once a day and get 6 cups with foam, 5 without. My second mama should kid any day and we’ll have more for cheese experiments. Then in Oct our Jersey cow should freshen and I think we’ll be bathing in milk!!! I’d really like to learn more about the Haloumi cheese. I’ve never heard of it before but it looks very interesting. Life is good! And you’ve done well adjusting to the learning curves. That’s half the battle. Good job! I couldn’t use all that milk, so will probably never have a goat or cow. But I would love to be able to make haloumi – how do you do it? I guess that is why wine and cheese go together, they both take so long to be ready to consume! My dandelion wine will be ready for the first racking in about two weeks. How is yours coming? I made two different kinds and they each have a distinctive smell, its interesting! You are so lucky! I can’t wait to start my next batch of cheese. I want a goat (just a little pygmy goat to milk and mow the lawn with) but I’m not sure how that will go over right in town. Your cheeses look lovely; feta is my favorite cheese to make (and eat). This looks like a very industruous and delicious hobby. I can’t wait to try it myself one day. The blue looks lovely and despite the fact that ricotta doesn’t qualify as cheese, freshly made ‘psuedo’ cheese sounds great too. I agree – how much fun! If someone had told me 26 years ago pre – goat that I would have a love affair with stainless steel and cheese cultures I would have slammed the door shut in their face! Hah, Hi Laurel. Yeah, fences DO help. We got a portable solar-powered electric one for ours and it’s great; we just move it around the property. Diana, well, that milkwave will definitely be hitting you soon too then and you’ll (hah) be forced to make some cheese. Really, it’s rather fun. Have you ever been to a Greek restaurant and had flaming cheese (opaa!)? That’s a cheese similar to haloumi, which is from Cyprus. It’s a salty cheese that keeps its shape when heated. Similar to feta but not as sharp. EJ, haloumi isn’t so hard from any of these other cheeses I am doing…it requires heating of the curd though to help it whisk away the whey and congeal. It’s tasty. But yeah I do get rid of a lot of the milk by (coughcough) selling its products to willing customers…there’s no way the three of us could consume it all. Hiya Liz. Looking at my wine last night it’s not quite ready for its first racking…need another week. I have a berry wine fermenting right now though! And yeah, this is some painful waiting, isn’t it? Aastricker, yeah, you should check with the local authorities to see how goats would go over. The Nigerian Dwarf or the Kinder are both good options for mini milk goats. 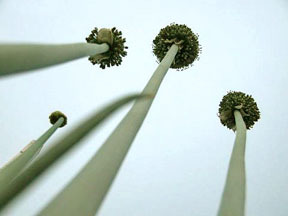 And lawn care: well, they’re only marginal with that but if you have any brush or weeds then they’re rather helpful. Isn’t feta fun and stinky?? Love it. Though not as much as that camembert my gah it’s seriously delicious. OG, it is loads of fun and for everyone in the family too as the goat(s) are quite characters. You can’t help but love them and look! milk and poop too!! Great for the gardens, really. I hope you do have them some day. Terry, hah! Same story here, absolutely. Although even back then I did go far in pursuit of a good meal. My absolute savior in all of this is restaurant supply houses for all those pots and stuff and then The Dairy Connection with their deep catalog of cultures. mmmm! Hi, El! I’m so enjoying reading your blog. Have you found a local source for cheese making supplies in SW Michigan or northern Indiana? I”m just about to end of the initial cultures I ordered from The New England Cheese Making Co., and I’d love to find something more local.